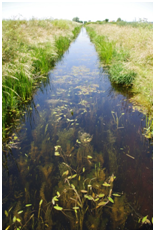 As part of the series of consultancy works we commissioned in 2013, extensive fieldwork has been carried out by two specialist consultants to define the biodiversity value of the ditches in the Ouse Washes Landscape Partnership area (OWLP). The results of this work have been surprising and very useful. In the OWLP’s largely arable landscape there are numerous ditches; these form a key element of the area’s character. The ditches often have their own unique biodiversity, but their ecology is generally poorly understood. A survey was commissioned by the OWLP during the development phase and this was carried out by aquatic plant and invertebrate specialists Jonathan Graham and Martin Hammond. They investigated ditches from the Internal Drainage Boards (IDB) and field drains for their biodiversity value. 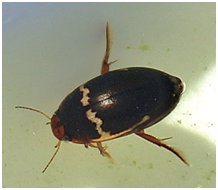 To determine the conservation value of the OWLP ditches aquatic plant species were recorded; due to the sensitivity of invertebrates to water quality, aquatic Coleoptera were also chosen for this purpose. This work highlighted that the ditches in the agricultural zones of the area harbour a wide variety of species and include a very good number of important aquatic plant species; the OWLP ditches also support many nationally scarce and near threatened aquatic Coleoptera species. The consultants found that the biodiversity richness in some parts of the OWLP area is comparable to that of the SSSIs in the area. Across 100 sample points, a grand total of 109 drain plants, 110 bank plants and 101 water beetles were recorded. Amongst the finds were many species of conservation concern; amongst these were: 2 Near Threatened, 3 Vulnerable and 1 Nationally Scarce plant species whilst water beetles included 4 listed as Near Threatened and 14 categorised as Nationally Scarce. Ditches in the study area are shown to provide an important habitat for several species of aquatic Coleoptera which have their British stronghold in the Fens such as Agabus undulatus, Hydrochus crenatus, Oulimnius major and O. rivularis. Dytiscus dimidiatus. Image: Jonathan Graham & Martin Hammond, for OWLP. 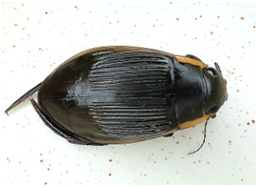 Agabus undulates, a diving beetle (Dytiscidae); GB status: Near Threatened. Image: Jonathan Graham & Martin Hammond, for OWLP. The Internal Drainage Board (IDB) Districts of Over & Willingham IDB, Bluntisham IDB, Haddenham Level Commissioners IDB, Sutton & Mepal IDB, Manea IDB and Upwell IDB were surveyed. All 6 surveyed IDB areas had drains with quality ditch plant and Coleoptera indicator species, but ditches associated with gravel beds (within the Over & Willingham, Bluntisham, Haddenham and Sutton & Mepal IDB districts) were found to be of particular importance. Overall, two districts (Haddenham and Sutton & Mepal) had a considerable higher proportion of drains of high ecological value. 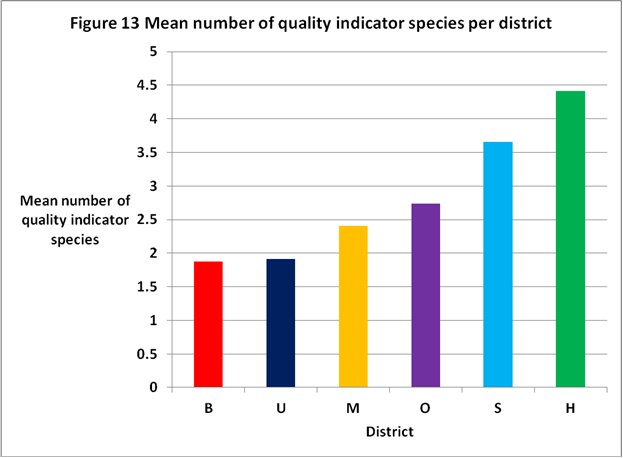 This figure shows the mean number of quality ditch plant and aquatic Coleoptera indicator species per IDB area for all sample points. B = Bluntisham IDB; U = Upwell IDB; M = Manea & Welney IDB; O = Over & Willingham IDB; S = Sutton & Mepal IDB; H = Haddenham IDB. Source: Interim report Jonathan Graham and Martin Hammond, Sept. 2013. 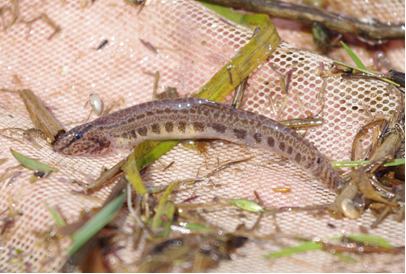 Spined loach, Cobitis taenia, is a European protected species; this one was accidently netted whilst sampling ditch Coleoptera. Image: Jonathan Graham & Martin Hammond, for OWLP. Ouse Washes LP area drains are also shown to be important for other noteworthy fauna: the Common Frog, Common Toad, Smooth Newt, dragonflies and BAP species such as Water Vole and Spined Loach were also seen within the ditches whilst sampling. One of the biodiversity-rich ditches in the OWLP area. Dominant stands of Myriophyllum verticillatum associated with Potamogeton trichoides and Sagittaria sagittifolia in open water of IDB drain. Image: Jonathan Graham & Martin Hammond, for OWLP. The research has provided indications that there may be correlations between ecologically rich drains (based on number of quality indicator ditch plant and Coleoptera species) and larger drains (between 3 and 5.5m), and between ecologically rich drains and early successional stage drains (those with open water and good light penetration). Both factors (larger ditches between 3 and 5.5m; early successional stage with open water and good light penetration) may also be directly linked to intensity of management. The majority of the high conservation value drains are IDB controlled and their management involves regular weed clearance (often annually), mild scraping of the bed (often annually as part of dredging works or as part of weed removal) and controlling of high water levels during the summer months (principally associated with agricultural irrigation of crops such as potatoes and beans). There is a strong correlation between number of ditch plant quality indicator species and number of water beetle quality indicator species, although it is important to note that some important water beetle species were recorded in ditches without good plant assemblages. Whilst the species-richness and quality of the wetland plant assemblage is evidently closely linked to management, water beetle communities are more likely to reflect the quality of vegetation structure. For open water species such as whirligigs, algivorous water beetles and larger diving beetles, regular management will be important in maintaining varied and structurally-complex aquatic vegetation. Many other taxa are, however, associated with the edges of the channel and depend more on the maintenance of refugia amongst the emergent fringe. The work has identified biodiversity ‘hotspots’ in the area; these can now be targeted through wildlife friendly farming initiatives. The work has also outlined possible links of biodiversity richness with certain types of ditch management. If the OWLP’s stage 2 submission will be granted, the research will be continued this year. The above correlations will be verified and further refined through further research in the remaining IDBs to the east of the Ouse Washes. this fieldwork is planned for the summer of 2014. Following that research, a final report will combine the results of the 2013 and 2014 research and clear recommendations for management of the ditches. This will be followed by targeted training sessions in 2015 and 2016 for staff at IDBs, landowners and farmers in the area, thereby ensuring that those who are responsible for the management of these ditches on a day-to-day basis will be provided with the latest information on best-practice management to conserve the unique fauna and flora of the ditches of the OWLP area. This entry was posted in Biodiversity, Consultancy work, Farming, Projects-Conservation, Stage 2-Development Phase, Theme 1-Water Everywhere, Theme 2-Hidden Heritage, Theme 5-Future Heritage, Wetlands and tagged Aquatic Plants, Coleoptera, Ditch Biodiversity, Ditches, IDB, Internal Drainage Boards, Survey by markatousewasheslps. Bookmark the permalink.